Even though I had the Mac Daddy of job offers, I was ridiculously stressed about actually quitting. First thing Monday morning, I emailed The Boss and asked if we could talk. I spent all weekend prepping for a phone conversation because I thought The Boss was on work travel, but his response to my email said to meet in his office in the late afternoon. Having to wait all day to give notice set my last nerves on edge, but as soon as the conversation started, I was on a roll. By the time I finished, I couldn’t have been happier. I practically skipped out of his office. Not only was I making a great career move, but also I was leaving all the job insecurity of the last 8 months behind. There were still some decisions to be made, as The Boss asked me to stay for 4 weeks instead of the 3 weeks I had planned on, but the hard part was over. 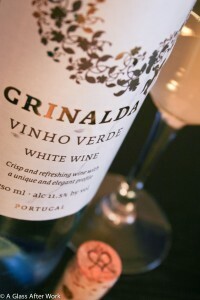 When I walked in the door of the condo, I gave Hubby a big smile saying that I did it, then cracked open a bottle of Vinho Verde to relax and discuss the timing of my big move while he made dinner. The 2010 Quinta da Aveleda Grinalda Vinho Verde (winery) is from Portugal and had a light straw yellow color. On the nose, there were green apples and limes. In the mouth, there were green apples and limes with a hint of peaches. The wine had a light body and bright acidity. Is this worth a glass after work? Definitely! 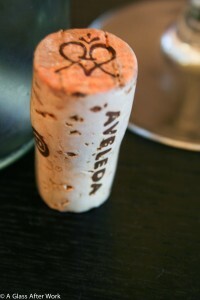 If you see this wine in the store, grab it; you won’t be disappointed. At $10, this bottle of wine is definitely after work and budget friendly, particularly on a hot summer night. It’s not very complex, but it’s light and refreshing. I find it difficult to pair wine with salad, but this was the perfect match for Hubby’s spinach salad, which is topped with pineapple teriyaki seared tuna steaks and is made with a light oil and wine dressing. I actually enjoyed a second glass after dinner, which is unusually for a Monday night, but I figured that if there was ever a day to do it, it’s the day I quit my job! Question of the Day: Do you a good job quitting story? If so, I’d love to hear it!